In version 2 of this book we included a case study about the Dharamsala Community Wireless Mesh Network. Following on from this original deployment in the subsequent years, a new set of networks and a commercial wireless ISP has emerged in the same region led by the same people. Here we describe one of their major projects. Rural Broadband Pvt. 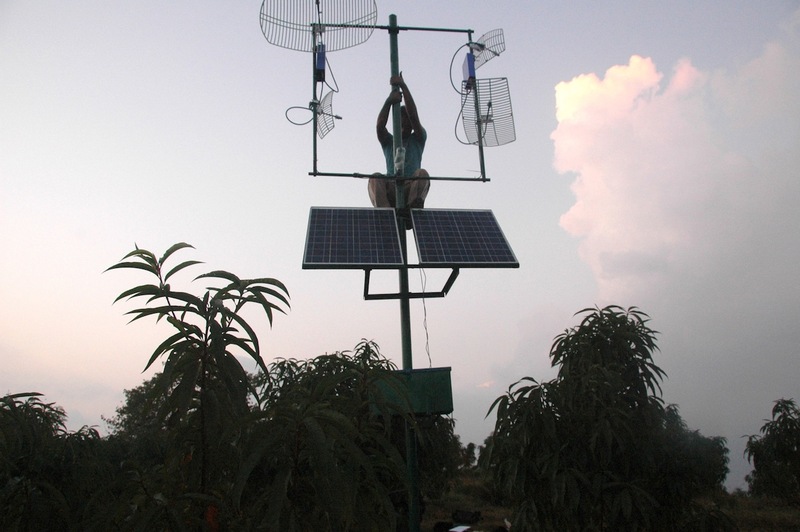 Ltd., is a leading innovator and implementer of technically and economically viable connectivity solutions for rural areas. We design, build and operate broadband networks in rural areas in India. Incorporated in India in 2009, RBB presently owns and operates networks in the Indian states of Himachal Pradesh, Uttarakhand, Jharkhand, and Karnataka. RBB uses AirJaldi as a brand name for its network and other connectivity-related initiatives. The company’s activities are carried out from our management office in Delhi, our operations office in Dharamsala, Himachal Pradesh and offices in each network location. Our diverse team includes local Indian villagers, Tibetan refugees, skilled professionals from metropolitan areas in India and people from outside India. We believe that rural networks need to be technically viable – they need to provide a quality and consistency of services that is at the very least similar to that offered anywhere else. They also need to be economically sustainable – they need to be able to stand on their own within a relatively short period of time (around 18 months) while offering clients services at reasonable prices. Further, we are strong advocates of an all-inclusive “retail ecosystem” approach – once we reach an area, we seek to connect all clients who are in need of connectivity, regardless of the size of their operation or package demand. We aspire to make all our clients pay for their connectivity, although subsidies are offered to selected clients, mainly those dedicated to social and developmental causes and showing financial need. RBB works closely with AirJaldi Research and Innovation, a non-for-profit (section 25) enterprise registered in India. Created in 2007, AirJaldi Research & Innovation identifies suitable and affordable networking solutions for rural areas, tests them in real-life environments and shares its learning with like-minded organizations and individuals. 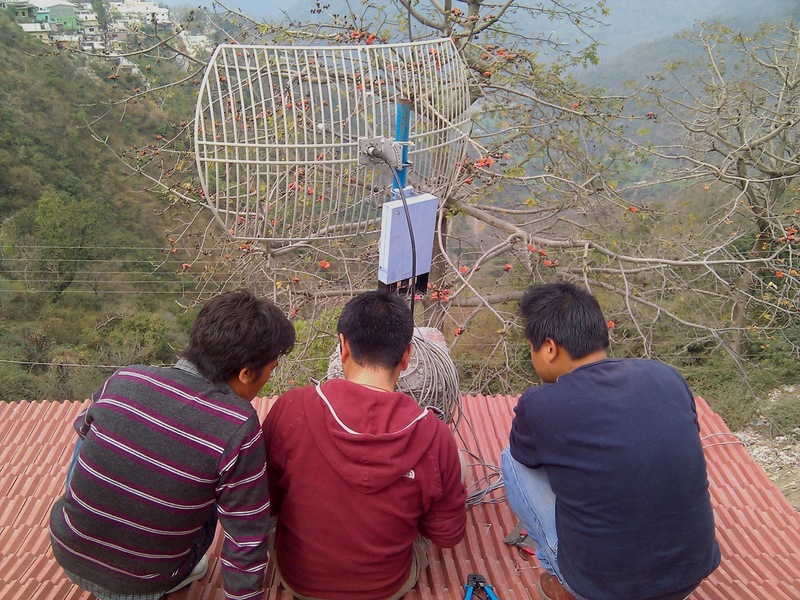 AirJaldi also operates a training and capacity-building centre in Dharamsala, where network operators and activists can acquire the skills to build and manage rural wireless networks. 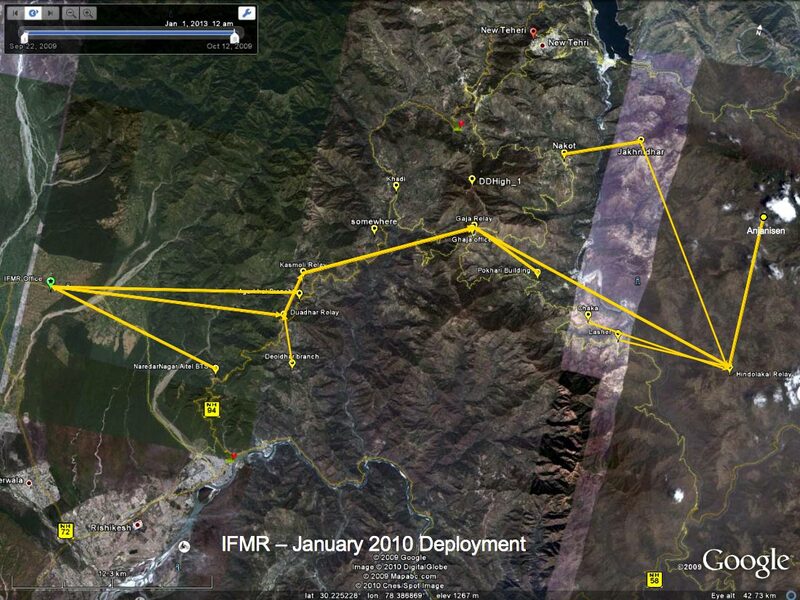 Most of our deployment team members have been trained by AirJaldi Research and Innovation. Team members normally take the basic one-month “Wireless 108” and the more advanced “Wireless 216” courses offered at the AirJaldi Network Academy. After an additional 3-month internship where they work under the close supervision of senior team members in one of our networks, they are enrolled as permanent team members. The Tehri and Pauri Garhwal districts of Uttarakhand, which stretches from the Himalayan peaks of Thalaiya Sagar, Jonli and the Gangotri group to the Dheradun Valley and Rishikesh, are one of India’s most mountainous areas. Renowned for its many religious temples, located on the banks of the River Ganges and on hilltops leading to the Himalayan range, the region is known for its rugged beauty. This ruggedness is however also a cause for the relative poverty of the region: its inhabitants live mostly in small villages separated from each other by tall mountains and deep valleys. The main local sources of income are subsistence agriculture and cottage industries. Many work outside the region, in large cities, in the plains and in military and government services across India. In 2009, KGFS Rural Services1, a micro-banking institution affiliated with IFMR Trust2, decided to set up operations in this hilly area. Their aim was to reach potential clients in the villages of Tehri and Pauri who until then had little or no access to regular banking services and were also considered “barely bankable” by most banks. Using population density mapping, KGFS sought locations for its bank branches at the centre of “catchment areas” reaching about 10,000 people. It soon became clear to KGFS that, having solved the density and accessibility pre-requisites, they were faced with severe connectivity limitations, as most of their proposed locations had no Internet infrastructure. initial deployment of VSATs and use of local ADSL services proved expensive, slow and prone to breakdowns. That was when we received a call from IFMR’s IT team, asking if we’d be interested in proposing a connectivity solution for their first 15 branches. How far is the closest available backhaul location (the place from where we can avail access to the Internet cloud) from the proposed deployment area? Our surveys suggested that there were relatively few backhaul locations in the area. Most were located in Dehradun and neighbouring towns (see Figure CSD 1). Reaching from there to the proposed deployment area proved problematic. After much effort we located a backhaul “drop” at a BTS in the town of Narrandar Nagar (see Figure CSD 1). Although very close to some of the branches, there was no line of site from the drop to any of the branches. 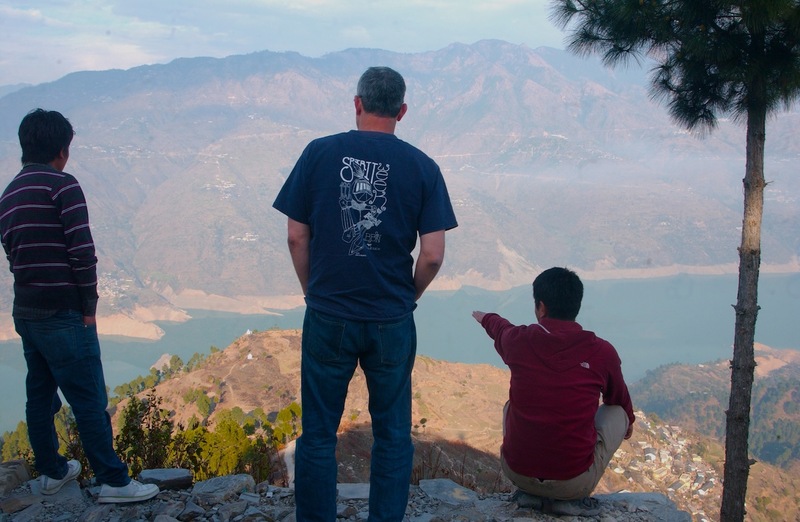 This led us to come up with a somewhat counter-intuitive solution: use the Narrandar Nagar location as backhaul to connect a Network Operation Center (NOC) that will be placed in the valley below, where better LoS to favourable mountain tops for potential relays was available. Can we propose a deployment plan that is technically solid but at the same time affordable to the “anchor client” 3 and additional future clients? Our initial survey of the area consisted of collecting latitude and longitude data of proposed branch locations, identification of possible relay locations, assessment of overall client potential in the area and assessment of the public infrastructure of the area. We were not surprised to find that the branches were mostly located in valleys (easier access for clients, close to roads) and separated from each other by high mountain ranges preventing direct LoS between them. Power supply to relays promised to be a challenge – most potential relay locations were either away from the grid or located at weak points where power was at times down for days and wild power fluctuations caused routers to “hang” or burn when power spikes hit them. Having decided that we will pursue this deployment, our deployment team had to make sense of it all. The solution we reached was based on placing solar-powered relays on as few strategic locations as possible. 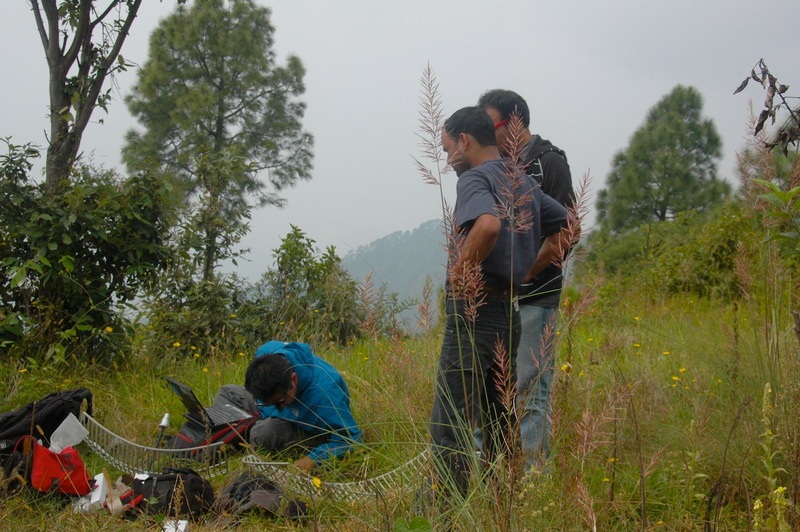 This led to additional field surveys, involving hours of preliminary office research using topographic maps, Google Earth and other tools, followed by days of trekking to identified locations in order to see if a location could be secured through a rent deal, and the safety and integrity of the relay guaranteed by the land owners. What is the overall client potential in the area and will it be sufficient to, at a minimal level, ensure that the network is economically self-sustainable within around 18 months? Client potential did not seem bright as well. Besides the proposed bank branches we found few additional clients – mainly schools and other organizations. We were sure that the client base will grow in time, but had to find a way to ensure viability in a relatively short time. 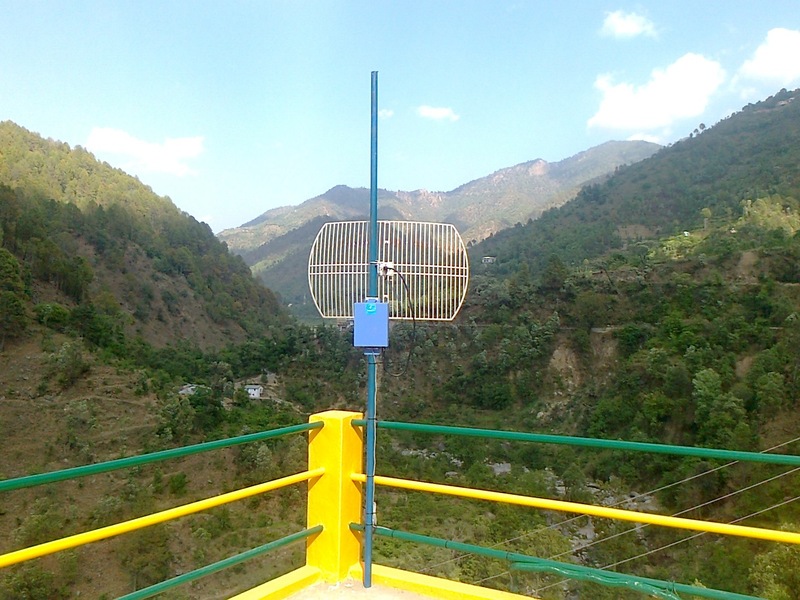 We decided to extend the network to more densely-populated areas at the foothills of the Garhwal range. The actual deployment work began in October 2009. After around two months of deployment work, the core network was ready.Its size was around 50x70km. It provided connectivity to 15 bank branches and around five schools and institutions in the valley. Most of its stand-alone relays were solar-powered and its longest single-hop link was 54 km. Three years on, the present network still caters to the initial 15 branches and original clients. It has also grown significantly. Its present size is around 120x100 km. Travel time between our NOC/Office to its furthest reaches takes around seven hours (! 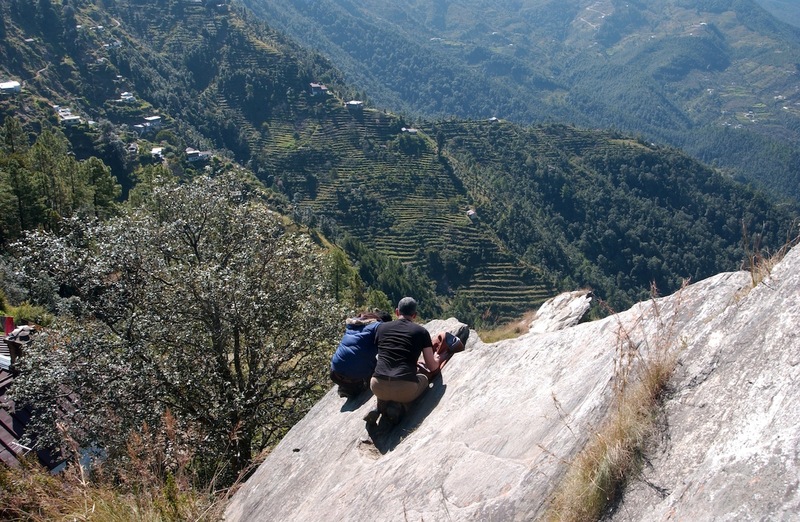 ), and the number of clients on the mountain ranges and valley has grown significantly. In its ongoing efforts to maintain this challenging network, our team has had to deal with land slides, snow, rain and thunder storms, wild elephants, leopards (yes!) and of course clients for whom much of this mattered little when their line is down. We are very proud of the fact that our average uptime in our years of operation in the area exceeds 95% and that the network has attracted much attention and praise from its users, other Internet players and the media. Energy – power is still a major challenge. The grid-provision is erratic and problematic. Using the grid as the power source for our relays (even with battery backup) has led to burnt routers and hours of travel to troubleshoot links drained of their power backup after the line went down. Solar power, on the other hand, although almost trouble-free4 is however still costly. Bearing the capital costs for these relays ourselves stretches a challenging economic proposition even further, while having clients pay the full costs for a relay limits the type of clients who can avail our connections.Some of our new connections have proven to be so challenging as to require a relay for each new locations, clearly not an easy economic proposition. Relays – a good relay is one that is placed in a location covering as much space as possible. In the Garhwal area, this means mountain tops. These places are normally and naturally hard to get to and quite isolated. Building, maintenance and security in these sites is an ongoing challenge. At the time of writing we are busy rebuilding a relay whose solar panels, battery, charger and other equipment were stolen. Size – as proud as we are in the size of the network, a travel distance of over 10 hours between its to extreme points is stretching out team, who move mostly on bikes, to the limit, with some trouble-shooting trips lasting over two days on account of travel. Energy – we have learnt that solar-powered relays are the only real option for the Garhwal network (as for many other locations). In trying to rationalize the costs for clients we have limited our deployment to private/small business clients to clusters where a minimum of 10 clients with a demand of at least 1Mbps per client can be identified within a 5-6 month period. A lower density means higher prices and is usually requested by clients for whose operations connectivity is essential. We have also begun to offer a “payment spread for time commitment” deals: clients pay for the cost of equipment and relays (or their share of it) over a period of time, if they agree to a contractual lock-in period of over two years. Relays – the best location is not necessarily the one with the best coverage ONLY, but one that present an optimal combination of visibility, security, accessibility and price. In certain cases this means a higher number of relays, but we believe that on the whole this is a cheaper and more rational option. Size – a simple solution to the size problem would be to break the network to smaller sub or autonomous network. We are using this approach in other networks, where the size limit is considered by a role of thumb of a max. of three hour travel to a site. This however makes little sense in a sparse network such as the upper Garhwal reaches. The compromise solution we came across was placement of “staging posts” in strategic network junctions. Essentially, these “posts” are storage spaces where equipment is kept in sufficient quantities to serve a defined catchment area. While not saving the travel time, it allows our team to move quickly without having to carry along heavy and bulky equipment. The evolution of a staging post to an operational base will come when keeping a team of two people at such a location could be justified by its client density and revenues. Economic viability – AirJaldi’s over-arching goal is to reach un-served and under-served areas with high quality internet connectivity. 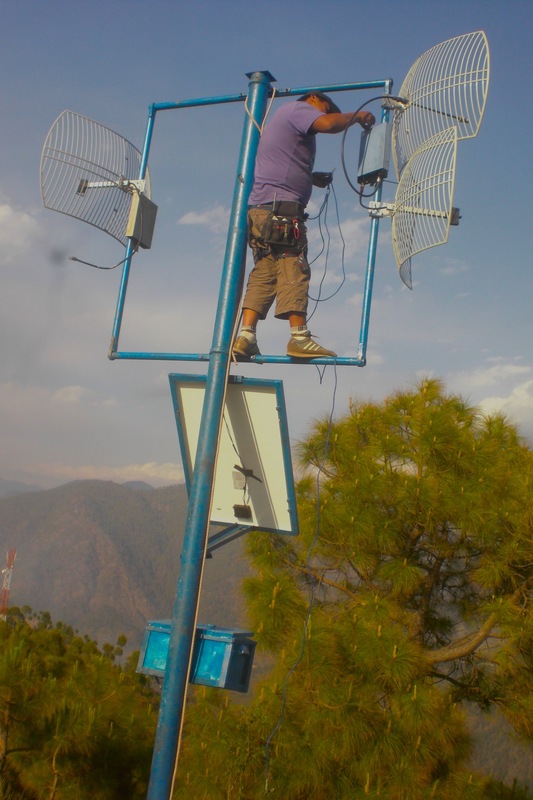 As such, the cross-subsidy model is justified as a partial solution to the challenges faced by many aspiring rural internet providers lacking the skills or desire to build networks of the scale of the Garhwal network. That is however cannot be the only economic avenue for deployment in such challenging environments. Our attempts to increase the viability of “mountain provision” include aggressive pricing of higher bandwidth packages – the marginal cost for higher bandwidth is relatively low, allowing us higher marginal revenues while still being able to offer very reasonable deals for such packages. This stands in major contrast to the non-scalable dongle and VSAT solutions that are often the alternatives to our services in these areas. At the other end of the spectrum, we have begun offering limited time/bandwidth packages. Although more expensive on a per-unit basis, these packages are appealing to clients who wish to limit their consumption to their economic willingness to pay. Future plans include introduction of “4-C”: local centers where users can utilize bandwidth for Classroom setup (online individual learning, live teaching to a classroom etc.) Cinema (watching films or other online content at a local center), Café (internet café where people can use individual computers) and Connectivity (through local hotspot in the area of the center or through connectivity deals to houses and offices sold at the Café). 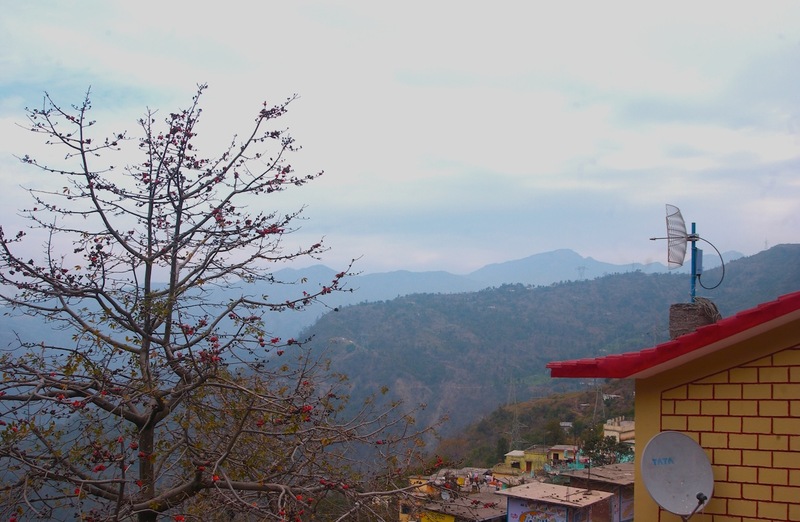 The Garhwal network was created in response to a request from an “anchor client”, a micro-banking enterprise for whom connectivity was a necessary condition for a successful implementation of its vision of rural banking. AirJaldi responded to the deployment challenge with the hope of ensuring high-quality and high-availability broadband internet connection and long-term economic sustainability. These objectives were reached through a combination of carful deployment planning, utilization of natural topographic assets, expansion of the network from the sparsely-populated mountain terrains to the more densely inhabited Dherdun valley, and aggressive pricing on higher bandwidth packages. Future plans include further expansion of the network, “thickening” of the client density in existing areas and enriching of packages and services offered by AirJaldi. 3 - Each of our networks has one or more clients which are referred to as “anchor clients”. The term denotes their role as the first clients in a network, and the ones that contribute mostly to its initial economic feasibility.